If you don’t want your iOS device to produce images in HEIC format you can disable this in iOS Settings. Below are steps to enable saving photos to JPEG format instead of HEIC files. Tap on “Most compatible” in the dialog below. Please note that “Most compatible” option will always use JPEG and H.264 for image and video compression. 4K recording at 60fps and slow-motion recording at 1080p and 240fps is not available in “Most compatible” mode. Scroll to the bottom of the screen and look for “Transfer to Mac or PC” option at the very bottom. 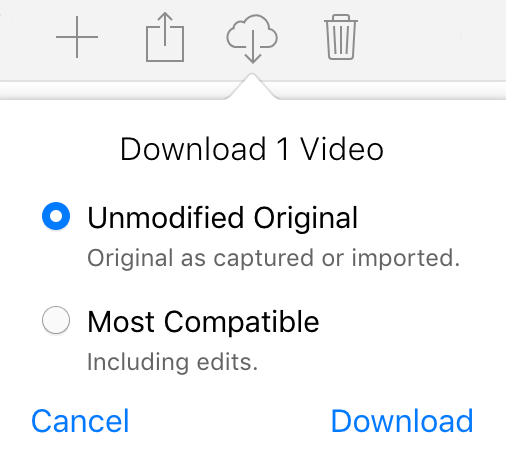 Select “Automatic” to transfer photos and videos in a compatible format. This will force iOS to transfer photos in a format compatible with a device where you are transferring photos to. In case of Windows OS this will be JPEG for images. If you have your photos automatically uploaded to iCloud you can convert them from HEIC to JPG using iCloud. To do this navigate to a photo you want to download in your iCloud account. Click on Download icon in the menu above. You will see drop down dialog as below. Select “Most compatible” and click on “Download” button to download JPEG file.